St. Stanislaus, Ozone Park, recently hosted its annual Catholic Youth Organization (CYO) pre-season basketball tournament to raise breast cancer awareness during the month of October. Over 30 CYO teams from Brooklyn and Queens entered the “Battle Against Breast Cancer” tournament. All proceeds were donated to charity organizations researching breast cancer. This year’s tournament winners included the following: fifth-grade girls, Our Lady of Hope, Middle Village; sixth-grade girls, St. Margaret’s, Middle Village; seventh-grade girls, St. Stan’s, Maspeth; fourth-grade boys, St. Mary Gate of Heaven, South Ozone Park; fifth-grade boys, St. Margaret’s; eighth-grade boys, St. Pancras, Glendale; 10th-grade boys, Mary’s Nativity-St. Ann, Flushing; 12th-grade boys, St. Stan’s, Ozone Park. 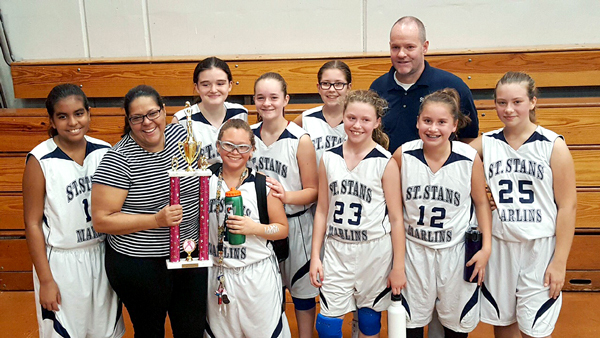 St. Stanislaus from Maspeth seventh-grade girls’ team presented the championship trophy to a team member’s mother who is a breast cancer survivor. Zoraida Felix, who attends St. Stan’s, was diagnosed with stage III/IV breast cancer in March 2013. She underwent a double mastectomy and reconstruction surgery, followed by chemotherapy and radiation treatments. Her cancer has been in remission since April 2014. Her daughter Nicole’s team won the division and the team presented her with the trophy at the following day’s CYO game.